"We love the 80's" april 26th 2014 Oslo - Thomas Anders Online - Die offizielle Fanpage! 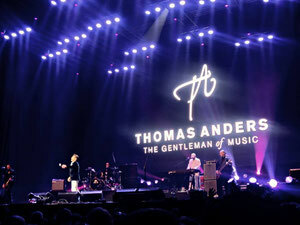 Thomas Anders and his band did a great show in Oslo on saturday! 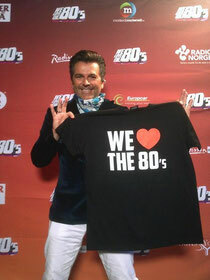 Thomas Anders and his band were playing in "We love the 80's" on Saturday Many known artists from the 80's like Kim Wilde, Nik Kershaw, Rick Astley, Bananarama, Samantha Fox and many others were playing old 80's song in this show. It was really great. Thomas Anders did a great show He sang Brother Louie, You're my heart, you're my soul and Cheri cheri lady. People celebrate a lot when he came on stage. Thousands were singing with him with in all the great songs from the 80's. Thomas Anders und seine Band hatten am Samstag, dem 26. April 2014, eine tolle Show in Oslo. Sie traten bei "We love the 80's" auf. Viele bekannte Künstler der 80-er wie Kim Wilde, Nick Kersaw, Rick Astley, Bananarama, Samantha Fox und viele andere spielten die alten Songs der 80-er in dieser Show. Es war wirklich toll! Thomas machte eine tolle Show.Er sang "Brother Louie", "You're my heart, you're my soul" und "Chery, chery Lady". Die Leute feierten, als er auf die Bühne kam. Tausende sangen mit ihm die großartigen Songs aus den 80-ern. Er hat hier in Norwegen noch immer viele Fans. Ich wünsche mir, dass er irgendwann allein ein Konzert in Norwegen gibt.